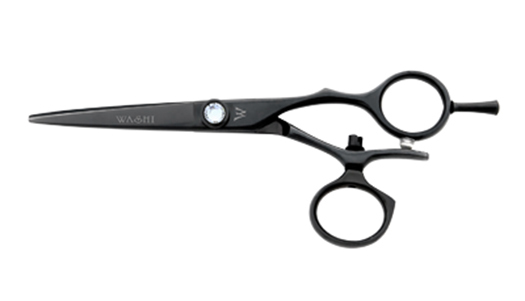 Shears feature semi convex edges for precision cutting and includes Washi's Anti-Push Edge to eliminate hair sliding. SV K Black Satin Swivel Shears. Titanium Swivel Shear. Forged from Japanese V-Steel. The 360° Rotating Thumb creates a horizontal cutting action. This natural position helps alleviate wrist and thumb fatigue. Lowers elbow and shoulder position, creates a low stress cutting action. The Black Satin swivel hair shear features semi convex edges for precision cutting. Includes Washi's Anti-Push Edge to eliminate hair sliding. Experience a natural cutting position. The rotating thumb creates a horizontal cutting action which in turn relieves wrist fatigue. Great for carpel tunnel problems. Lowers the elbow and shoulder position and allows for a flat wrist position while cutting. Also available in Double Swivel! Shear Size: 5.5", 5.75", or 6.0"